"God is a child who amuses himself, going from laughing to crying for no reason, each day reinventing the world to chagrin of hair-splitters, pedants, and preachers..."
2.1 Does God have authority over us? 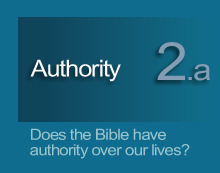 Does God have authority over us? If he did not, it would be pointless to pursue how or if that authority is extended by way of the Bible. The dictionary defines authority as the power to command, to enforce laws, to exact obedience, and to judge. Can we find evidence in the Bible to support the belief that God possesses such authority? The answer is a resounding and definite yes! The written record of the Bible demonstrates that God exercises authority in each of those areas. While God has created us to be free moral agents, God's authority over humanity remains expressly clear. We may not always feel his authority, nor feel bound to abide by it, just as we might not always feel the government's authority over many of our personal and business activities. In both cases, the authority which exists over us does so whether we feel it or not. The manner by which we are to understand and respect God's authority is by studying how God has revealed that authority to us. This begins with understanding more about God's nature. God's nature, as he has revealed it, is of a triune nature; each facet having a somewhat unique role in the overall authority of God. 2.2 Describe the triune nature of God. God has revealed himself to mankind in three facets. These facets are sometimes referred to as persons or the trinity, though it is critical to maintain that the essence of God is singular ("The Lord our God is one" Deuteronomy 6:4). Those three facets are: God the Father, God the Spirit or the Holy Spirit, and God the Son. The universe itself is one such example of a triune composition. The universe (uni meaning one) is made up of three components: space, time, and matter (energy and matter being synonymous as exemplified by E=mc2). 3.) past, present, and future for the continuum of time. 1.) The future is unseen and unknown to us except as it perpetually reveals itself to us in the present. 2.) The present, though it proceeds out from the future, has actually existed as long as the future itself. 3.) The future, being time-invisible, is made visible to us only in the form of the present. It then returns to being time-invisible in the form of the past. 4.) Though the past is time-invisible or, more precisely, time-no-longer-seen, it still influences us in the present with regard to the future. 5.) In each of time's three facets - past, present, and future - time remains but a singular triune facet of our space-time-matter universe. 1.) God the Father is unseen and unknown to us (John 6:46) except as he reveals himself to us in the Son (John 17:3-8). 2.) The Son proceeded from the Father (John 6:57) though the Son has always existed as long as the Father himself (John 17:5). 3.) The Son is the unseen Father made visible for a time (John 14:9) who, upon returning to heaven, then sent his invisible Spirit to be with us (John 14:16). 4.) Though the Spirit is unseen (John 14:17), the Spirit influences us in the present by the authority of the Son that we might give glory and worship to the Father (John 4:23, 16:13-14). The Bible instructs us that God's character is wholly and perfectly reflected in each of his persons. However, through each of his persons he has established a somewhat unique interaction with humanity. Though Scripture does not always specify to which, if any, of God's persons his specific roles of authority and power correspond, Scripture often presents facets of God's authority as being emphasized more in one than another. God the Son as the executor of that authority. In establishing whether or not we are under any authority that God may have imputed to the Bible, it must first be shown that God has authority. That may seem like a no-brainer, but the Bible presents God as having revealed himself in specific facets or "persons". In each of these persons, different aspects of God's authority seem to be stressed. This section briefly describes God's triune nature and suggests to which of God's three persons those different aspects most apply.